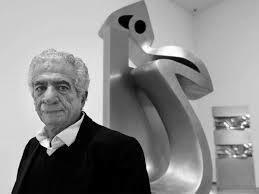 Tanavoli’s work has been auctioned around the world leading to overall sales of over $6.7 million, making him the most expensive living Iranian artist. Tanavoli is known for his heeches, three dimensional representations of the Persian word for ‘nothing’, heech. Composed of three Persian characters in the style of nasta’liq. The three letters he, ye and če are combined to produce the word ‘Heech’.